For those who celebrate the holidays, it can be a time of stress. There are numerous events like parties or school functions filling up your calendar. There are financial concerns and stress of family gatherings and relatives. There’s a faster pace than typical, shortened daylight hours and colder temperatures. Not to mention increased consumption of foods, especially sugar and alcohol. As a result, we feel fatigued and overwhelmed. We get less sleep and can experience mood swings (that short fuse reaction) and some women may experience menstrual cycle irregularities or worsened PMS symptoms. 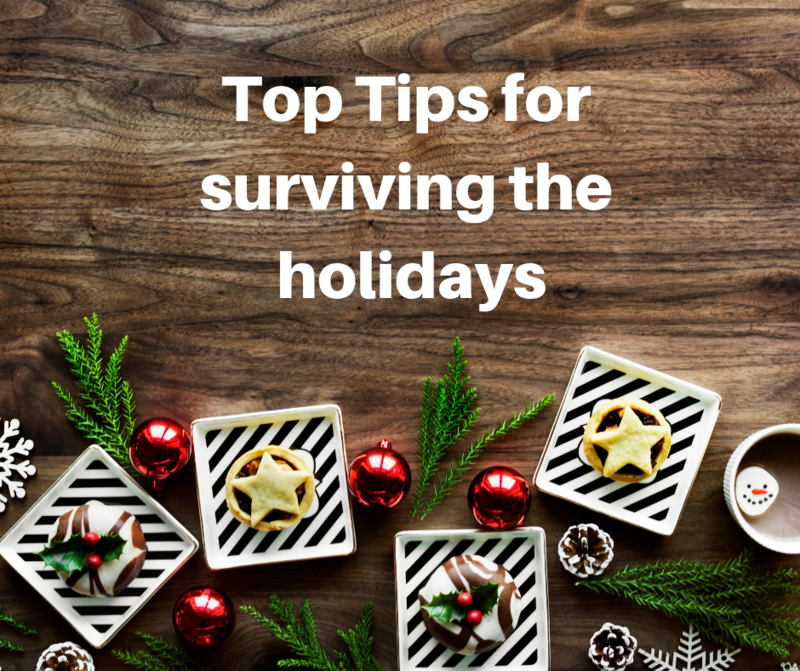 Although it would be ideal to remove all of the holiday stress, this is often not possible. Instead, focus on improving your resiliency to stress to improve your symptoms, so that you’re able to enjoy this time of year. Though most of these tips may seem obvious, we often neglect the simplest practices that go a long way in improving and maintaining wellness. Here are some tips to improve your stress resiliency this holiday season. 1. Get sufficient rest and sleep. Prioritize sleep and down time. We tend to sacrifice sleep in order to get in as much as we can, but sleep is one of the best ways to improve our resiliency. Sleep is the time when our body is undergoing restoration. Set a realistic bedtime for yourself and stick to it. Aim to go to bed before midnight and avoid the use of any electronics with a screen for at least 1 hour before bed. 2. Avoid caffeine or energy drinks. These may provide a boost in “energy”, but the effects are temporary. Lattes and energy drinks contain high amounts of sugar, which provide a quick boost in energy, but leave you with a lull or crash soon after. Instead, hydrate with sufficient amounts of water, grab a cup of herbal tea like peppermint or rooibos or try a stress-busting Maca Latte (recipe below). To calculate how much water to drink daily, divide your weight in pounds by 2 (this is the number of ounces to drink daily). Divide this number by 8 to get the number of cups of water to drink daily. For example, if you weigh 150 lbs, divide 150/2= 75 ounces. Divide 75/8 = approximately 9.5 cups of water daily. This can be as simple as doing 3 minutes of meditation daily, taking 5 deep belly breaths upon waking, colouring, going for a 15 minute walk on your lunch break, taking a bath or reading that new book you got months ago that’s sitting on your bedside table. The point is to do something that makes you feel good, ideally everyday, but realistically as often as you can. Remember that it doesn’t have to take hours. It just has to be something for yourself that nourishes you and makes you feel good. Instead of getting gifts for your friends, plan self-care time together, like going for tea or for a massage or to the spa. Yes, it may be cold outside where you live, but getting outdoors in nature (especially during daylight hours when the sun is shining) is a reliable way to boost your physical and mental well-being. Do something in the morning that sets an intention for your day. These types of practices promote relaxation and calm in the body. They activate the parasympathetic nervous system, which is our rest, digest and relax part of the nervous system. 6. Eat protein and healthful fat with each meal and snack. During the holidays, we’re often loading up on empty calories, like chocolates, alcohol, baked goods, etc., which contributes to imbalanced blood sugar, fatigue and brain fog. Eating sufficient protein and healthful fat with each meal and snack helps to bring the body back to balance. If you skip a meal or consume a lot of sugar, make sure your next meal or snack contains healthful fat and/or protein to help get you back into balance. This is about getting more greens in your diet to balance the higher intake of sugar and alcohol, which lead to nutrient depletion. Add dark leafy greens like spinach, collard greens, kale, Swiss chard or beet greens to your daily diet. Toss a handful of greens into your morning smoothie or into soups or stews, as a sautéed side to eggs or blended into homemade dips to amp up the health profile. 8. Get rid of temptation. You can hear that box of chocolates in the cupboard calling your name, tempting you to eat “just one”, or that carton of eggnog in your fridge “egging” you on to have a cup, or two. Do your best to avoid bringing these temptations home or purchase smaller sizes. Skip the eggnog this year and sprinkle some nutmeg, allspice and cinnamon onto your non-dairy or regular milk. Bring that box of chocolates to your office to share with your colleagues (so you don’t end up eating the entire box). The best way to improve your stress response is to reconnect to the tools and practices that lead you to success. Try a few of these tips this year or at other times of increased stress. Find what works for you and be consistent. If you’re finding that your stress isn’t improving, or you could use some additional support, come see Dr. Haarsma. She can provide further tools and strategies for reducing stress as well as individualized treatment to support your body’s stress resiliency. Maca is a root that grows high in the mountain in South America, mainly Peru. Maca is an adaptogen, meaning it helps the body adapt to stress. It also can improve energy levels, so it’s best to consume this drink in the earlier parts of the day, so it doesn’t interfere with sleep. Warm the milk in a small saucepan (removing from the heat just before it starts bubbling; watch as this can happen quickly and will boil over). Transfer the milk to a blender along with the remaining ingredients. Cover the top of the blender with an old dish towel (as hot liquids will rise and can spill out, causing injury). Blend until smooth. Or for a non-blended option, add the maca powder, cocoa powder, cinnamon and vanilla into a mug. Pour approximately 2 tbsp of hot milk into the mug. Whisk to combine and remove lumps. Pour the remainder of the hot milk and whisk well to combine.